Each function of this complex, which purifies river water for drinking purposes, has its own separate building. From the reservoirs (1) where the first 'natural' purification takes place, the water is pumped into a 140 metre long dosing block (2). Here it is filtered in rotating drums and provided with chemical additives. The structure of the dosage block is of precast concrete portal trusses connected lengthways by shaft-like edge beams. Dry air is blown through a cavity in the steel roof to prevent condensation. Most of the block's equipment is housed underground. The most spectacular of the complex's departments is the filter house (3) containing four rapid filters and four flake filters. Its vast roof (107 x 133 m.) consists of 20 concrete shells separated by narrow strips of glass. Tilted glazed walls envelop the whole. To avoid condensation here, too, the concrete shells have been treated with a ventilated layer of insulation and the underside of the glass strips supplemented with a heated polyester screen. Walkways along these rooflights are reached from a spiral stair painted pillar-box red. The glazed facades are hinged at the shells, and their parapets so attached as to be able to absorb any motion of the concrete shells. Once treated, the water is stored in two circular clean-water reservoirs (4). 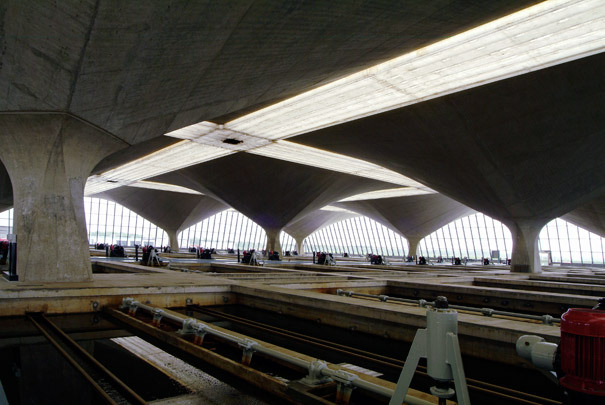 Their globular shell roofs are each supported by a continuous edge beam on concrete columns. The roof structure is held entirely free of the slanting walls. The walls of the high-pressure pumping station (5) largely consist of stacked precast concrete elements admitting only indirect sunlight to forestall any heat build-up during the summer. The main block (6) of offices and laboratories stands in a reflecting pool on concrete columns. A pedestrian bridge connects its glazed entrance to the mainland. Spread across the remainder of the site are company dwellings (7), workshops (8) and a ferrous sulphate block (9), the upper section of which is a hexagonal concrete shell borne aloft by three concrete slabs and containing six identical storage tanks. The Berenplaat water-purification plant shows Quist to be an inventive structural engineer who has managed to reveal the core of the matter by expressing both function and structure in an exemplary manner.